Toronto certainly has done us proud. One weekend. Two days. Countless sponsors and volunteers. Thousands of supporters. And the endless hours of dedication and hard work from two wonderful organizers. Congratulations Toronto! We have raised just over $28,000 for Toronto Bakes for Japan, all of which will be donated directly to the Japanese Red Cross Society. As a baker, it was the very least I could do to help out. I was happy to lend a hand in donating some baked goods for a great cause. After some thought and a few changes to my original plans, I decided to make three things for the bake sale: chocolate hazelnut meringues, lemon rosemary olive oil mini loaves, and maple bacon brown sugar scones. 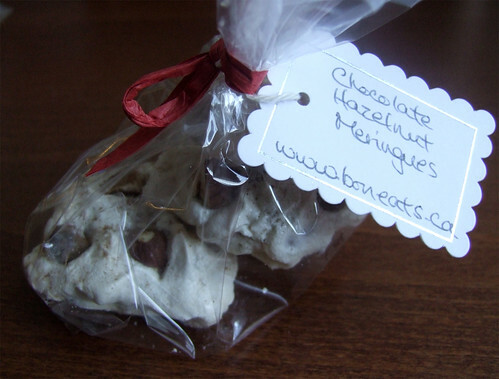 I've raved about these chocolate hazelnut meringues before. They are so, so easy to make, look so pretty and elegant, and incredibly tasty. Best of all, they keep, so I was able to make them a few days in advance and keep them in airtight containers before they were ready to be packaged. Back in December, I was gifted with a bottle of extra virgin olive oil from California Olive Ranch as a thank you for allowing them to use one of my photos on their blog. It's been sitting in my pantry for the past few months and I didn't think much of it until the other day when I was fishing through my pantry for inspiration. 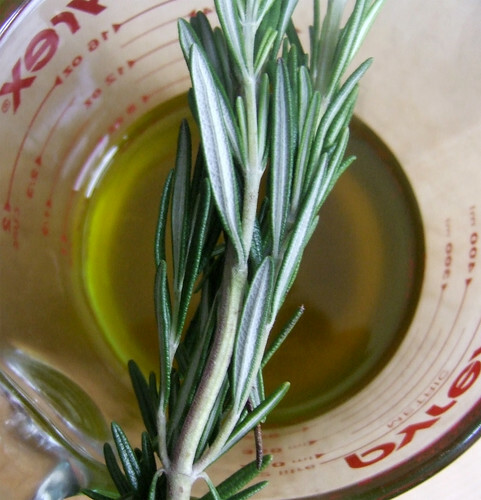 I love olive oil and I particularly love baking with it—it imparts such complex, fruity and almost grass-like flavours to your baked goods. I knew I had to use this in something, and decided that pairing it with lemon and rosemary would be a good idea. The original recipe comes from Patent and the Pantry, although I made a few minor tweaks here and there. 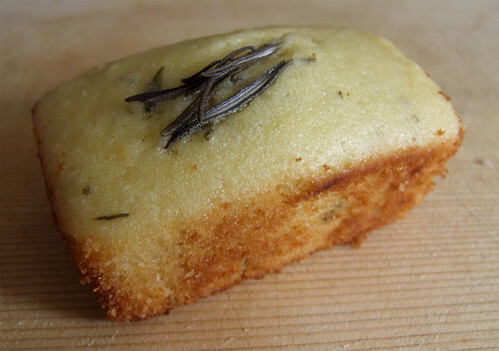 They looked adorable baked in their little mini tins, and my apartment quickly filled with the scent of lemon, rosemary and olive oil. Such comforting smells. Personally, I found them a tad bit on the dry side. Perhaps I overbaked them slightly, but if I were to remake these again in the future, I'll play around with some of the ratios. I'm also thinking of adding some texture to them by adding some cornmeal. Making the scones was a lot of fun. Obviously when working with bacon, your apartment will smell divine. Well, it gets even better when you first dredge the bacon in a mix of brown sugar and cinnamon and then stick them in the oven. Instant pig candy. I love these. It's sweet. It's savoury. It's rich and flaky. Use a good quality bacon. I used some maple-cured bacon I had picked up while at McCully's Hill Farm—they were a super smokey variety which imparted such incredible smoke flavour to the scones. The saltiness of the bacon also counterbalances nicely with the sweetness of the glaze. This is certainly a treat for breakfast! My treats were hauled to Evergreen Brick Works Saturday morning. 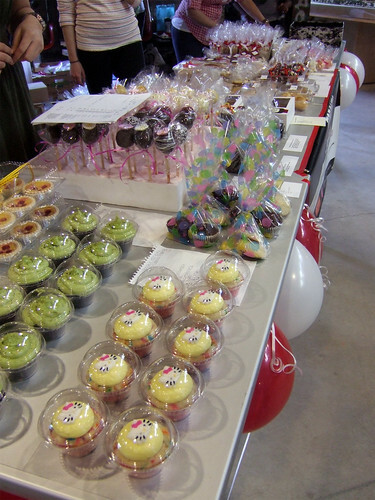 By the time I arrived, the tables set up for the bake sale were already filled with dozens and dozens of yummy looking treats, with many more boxes and bags on stand-by in the back. 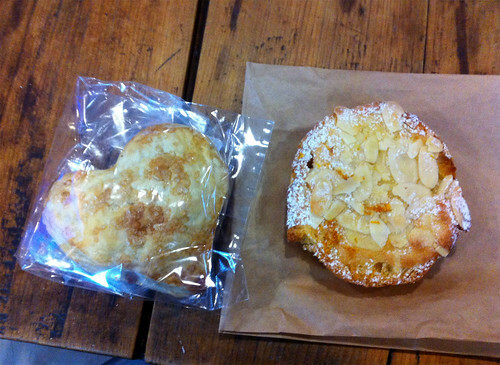 While I couldn't stay and help out, I did show my support and picked up a few treats before I headed on my way: Jennifer's heart-shaped apple handpies (they looked to cute and loving to pass up) and Samantha's bostock (a delectable concoction of day-old brioche soaked in orange blossom water syrup, covered with almond cream, and baked). Samantha claims she doesn't bake, but she certainly fooled everyone because they were so divine. 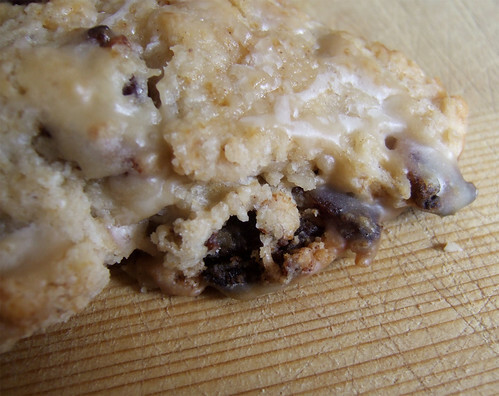 So good, in fact, that I begged her to post the recipe so that I can remake them at home when the craving hits. I'm so thrilled to hear that the overall campaign has been such a success. A huge, huge round of applause needs to go to Heena and Niya, the two organizers of Toronto Bakes for Japan, who have dedicated so much of their time and energy into making sure all the details were looked after. It's not over yet though! Let's try to reach the $30,000 goal! If you weren't able to make it out to the bake sale last weekend but would still like to support the cause, you can donate online. Or if your sweet tooth still hasn't had enough, Heena is heading into the kitchen to whip up a few treats for an online bake auction. Get a preview of what she has in store! Bidding ends on Saturday, April 16. Thank you Toronto! You are amazing! To make the bacon: Preheat oven to 375°F. Lay a wire rack on top of a baking sheet. On a large plate, mix sugar and cinnamon. Dredge bacon slices through the mix, lightly patting the sugar on top. Lay strips on wire rack and bake for 20-25 minutes, flipping the bacon once. Remove and drain on paper towels for 1 minute. Allow to dry completely before crumbling and chopping them into small pieces. To make the scones: Preheat oven to 425°F. In large bowl combine dry ingredients. Cut in butter (using two knives or a pastry cutter) until it forms coarse crumbs. With a wooden spoon, stir in buttermilk, maple syrup and vanilla. Fold in bacon crumbles. Turn onto a lightly floured surface and knead gently until the dough just comes together. Do not overknead (you're not making bread!). Divide dough in half and pat into 7-inch round circles. Brush with buttermilk and sprinkle with coarse sugar. Cut into 6 or 8 wedges. Bake for 15 to 18 minutes, or until golden brown. Remove from the oven. Top with maple glaze. While the scones are baking, make the maple glaze. Combine syrup, vanilla and icing sugar and stir until combined and the sugar has dissolved. Based on the consistency of the glaze, add water a few drops at a time and stir—if you accidentally add too much, just add a bit more powdered sugar. Continue to stir until desired consistency is reached. 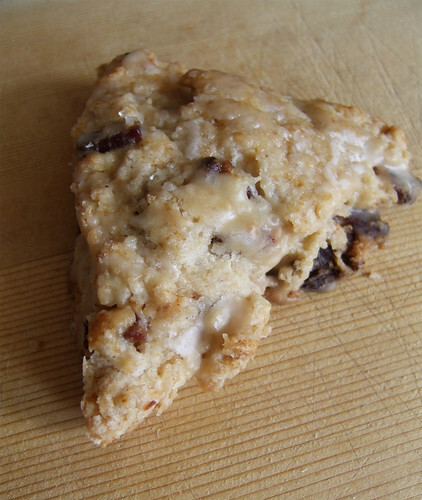 Remove the scones from the oven when done and move to a cooling. Drizzle the glaze over the scones and allow to glaze to set. Serve warm or at room temperature. Best enjoyed the day they are baked! 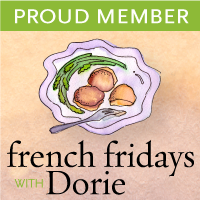 Posted by Bonita at 8:45 a.m.
Suzanne Ellis April 15, 2011 at 1:06 p.m.
Oh my goodness, those scones look divine! Think I may try these and bring them out to the fam for the long weekend!! Jen H April 15, 2011 at 1:11 p.m.
Yum! I'm sure the hubs will be very happy if I make those scones. I scored a bostock at the end of the day too but had no idea what it was. I'm excited to have that recipe too.